Now version is beta. Please wait a bit. Download patched Viewer and copy to original viewer folder. And execute it. 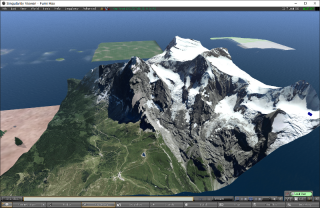 Set all Texture Elevation Range of Terrain to 0.0 (both Low and High) at World, Region/Estate menu in Viewer. Create Object and create new script. Copy and paste LSL (TerrainModifyer) and conf note card (TerrainMod.conf). 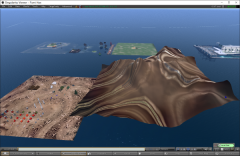 Web Server Scripts (PHP) download Terrain Height data and Terrain Texture Data. get_height.php : down load height data as string data. get_texture.php : down load texture data. Direct display terrain textures on Region. Install original Viewer and copy the below patched Viewer to original Viewer installed folder.